Perhaps there’s no greater political Rorschach test than the way people react to certain news stories. Currently, the news catnip du jour for conservatives are Solyndra and Fast and Furious, each of which has received a middling amount of coverage in the mainstream press. 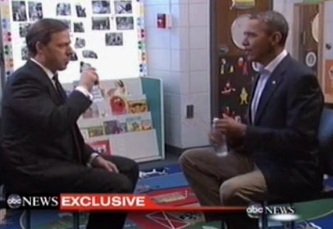 Today, conservative media watchdog Newsbusters expressed outrage that a Fast and Furious question was left out of ABC News broadcasts of Jake Tapper‘s exclusive interview with President Obama. Fortunately, we’ve got the exchange here. The news catnip phenomenon isn’t exclusive to conservatives, but as the current political opposition, they are naturally more susceptible. During the Bush administration, there were a raft of stories that liberals felt weren’t getting enough attention. Sometimes, the criticisms of the media are valid, sometimes not. Often, partisans on either side ascribe left/right bias to such editorial decisions, but even when the criticism is valid, the bias is usually far shallower. In Fast and Furious, conservatives see a scandal that could take down the entire Obama administration, while liberals see a botched law enforcement operation that Congressional Republicans are overselling with a legislative hearing fishing trip. The mainstream media, meanwhile, has been covering the story, and following it to see where it goes, and in some cases, leading the charge. ABC’s Jake Tapper on Tuesday pressed Barack Obama on the Fast and Furious gun scandal, but his network didn’t allow the question to appear on Nightline, World News or Good Morning America. (All played clips of the interview.) Instead, ABC found time to air Tapper and the President playfully discussing children’s books and the greatness of Dr. Seuss. Now, to an audience thirsty for any and all things Fast and Furious, that choice does seem absurd, but from a media standpoint, is it really so cut-and-dried? The Dr. Seuss clip is unusual and entertaining, a humanizing, unguarded moment for reporter and subject alike. Its news value rests largely in its behind-the-curtain vibe. The real question isn’t why they included the Seuss clip, but why the Fast and Furious question was omitted. I reached out to ABC News for comment, but it’s rare for a network to comment on editorial decisions like this, and the reasoning is pretty obvious to me. When I got the transcript of the interview, I actually searched it to see if there was an F&F question, knowing the keen interest that many of our readers have in the story. The President’s response, however, was nothing new, and in the absence of any other context in the interview, wasn’t all that newsworthy. While the exchange was short, editing in enough information to properly contextualize it would have proved time consuming, with little return. On the other hand, since it was such a short exchange, you could argue that cutting some b-roll and other filler would have made it possible to include it. That’s a judgment call, one that news editors get to make. As Whitlock points out, the transcript is readily available, and easily publicized by websites like Newsbusters and Mediaite. You can decide for yourself if this was a case of “spiking,” but to all appearances, it’s just an example of sound editorial judgment.